Vancouver instro-rockers the Falcons recently had their independent CD, Queen of Diamonds, chosen as best album of 1998 by UK's influential surf-music magazine Pipeline. As lead guitarist and main songwriter Mike Beddoes explains, that's a far better reaction than he got the first time he performed that album's title track, in a Grade 8 talent contest at Lord Byng High School. 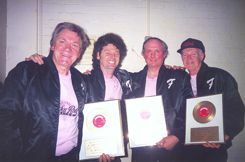 "That was a fiasco," Beddoes recalls, "The drummer and I were too lazy to rehearse, and when we got onstage they closed the curtains in front of the drummer, so he couldn't see or hear me. When I started playing the song, somebody had to go back and tell him to start, so then he chimed in. He only stopped playing when I went back and said, 'It's over.'" Needless to say, Beddoes and his hapless pal did not claim first prize that day. New Gandy Dancer: As we move towards 2000, what have you learned about playing in an instrumental band in the last decade and have The Falcons changed in direction? Mike Beddoes: I've learnt that people still expect singers! But after a couple of numbers, they get acclimatised to all-instrumental. Direction? Well we're more focused since 1992. Also, we know there is an audience for this stuff which is pretty encouraging. Getting album of the year from Pipeline was real recognition for us too. NGD: What has been the reaction of live audiences to a band that doesn't sing and doesn't play covers? MB: Relief from those who have heard me sing! No actually, we do play lots of covers live like "Apache", "Meadowlands" and "The Mexican". With our new drummer, Andre Deslauriers, we've added a few tunes with drum solos like "Diamonds" and "Let There Be Drums". NGD: Why do you think that instrumentals, never mainstream pop, still keep hanging in there? Is it a musician's thing? MB: I think the old instrumentals have a fresh sound that's as good today as when they were first recorded - just like early vocal rock & roll. I think the music is the most important port - more important than just the image. 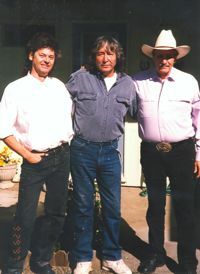 When I played with Nokie Edwards and Jimmy Torres down in Oregon, they sounded just as good as ever. It probably is a musician's thing because you can play instrumentals even when you're an old guy - look at Link Wray. NGD: Along with very few other bands, you seem to have been banner-waving for Canadian rock instrumentals this last decade. Why has the North American instrumental scene been so swamped by the USA and European scenes and do you think The Falcons have been successful in correcting the balance to some extent? MB: Well there's tons more people in Europe and the USA, so it's no surprise we were swamped by their music. The big deal about Canada though is that we heard The Shadows and The Ventures, not just one side or another. So even today, Canadian instrumental bands are more influenced by The Shadows than our American counterparts are. Correcting the balance? You bet! Canada uber Alles! I'd like to think we're helping people pick up on Canadian stuff but I don't know. 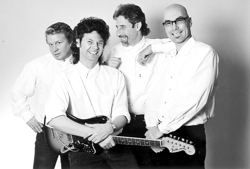 Canadian bands are usually thought of as imitation American bands. For instance, on "Evening In Nivram", we're labelled an American band in the liner notes. I guess that's a compliment. NGD: Most forms of today's music have been infiltrated - if not overwhelmed - by computers, programming, drum machines etc. It hasn't happened though to any large extent with instrumental bands. Is this a part of the character of guitar instrumental groups? MB: Yeah, most definitely. Instrumental rock has certain characteristics that define it - no computers, no synths, no drum machines. But if you go outside the constraints, like Joe Satriani, then it's no longer rock instrumental And it's not just the guitar bands. Sax-led bands playing things like "Raunchy" or organ like "Green Onions" are the same. Instrumentals started the same time as ordinary rock but ended in the mid sixties. As a genre, their big charm is that they didn't change or adapt. NGD: That being the case, what is the authentic instrumental recording all about? MB: Authentic recording to me means real musicians with real instruments. The way The Falcons record is live off the floor - you know, drums, bass, and rhythm guitar record simultaneously while the lead plays a dummy track to cue people. The lead is added next and then double tracked (played again). All recording and mixing is done on analogue tape recorders and the sound is digitised only during the mastering stage. All this makes for a pretty good 'live' sound. ....Central to the sound of [The Falcons] is the deep, fat bass of Gord Kearney. His use of a 1975 Fender Precision Fretless provides for an unusually rounded and, on slides, characteristically smooth and unbroken tone, providing a dependable pillar for the rest of the band to build around. Kim Clarke, the interestingly close-shaven one with an arty beard, uses a modern Rickenbacker twelve-string semi-acoustic for rhythm which adds a notable warmth and substance to their sound. Lead guitarist Mike Beddoes' choice is a 1966 Fender Jaguar or sometimes a 1964 Gibson Firebird 3, and of course it is principally Mike's compositional prowess and instrumental dexterity that makes the band such a standout. Hank Marvin is clearly a prime influence but, beyond that, there is the legacy of classical training which lends the multi-picking ability to adorn and embroider central melodies with conversational asides. The band insist on using tube amplifiers such as Mike's 1963 Gibson Falcon and Gordy's 1970 Ampeg, and all effects are electro-mechanical with spring reverb and tape-echo instead of their digital equivalents. The four man line-up is completed by Mitch Lazer, a lively go-get-em drummer who is also hip to the subtleties involved in playing instrumentals. Dems da Falcons, folks. 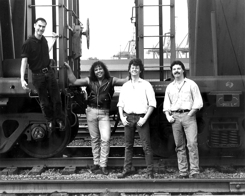 The band first formed in Vancouver during January 1991 as Dreamrider. 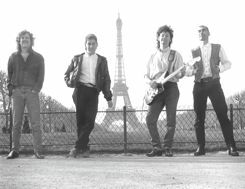 Consisting of Mike with Ted Harrison (drums) and Brian Harton (bass), they recorded a three track cassette featuring "Dreamrider", "Rikki" and "Come by My Love". 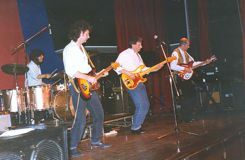 In the summer the band experimented by adding different rhythm players and changing bassists, eventually disbanding due to other commitments. "Beer and heroin, beer and cocaine, beer and singing in a C&W band" Mike adds wryly! By autumn he had decided to try again, this time naming the band The Falcons after his vintage Gibson amplifier because, as he explained, "It suggests the era and the music that had first inspired us". By January of '92 Mike had completed another three track cassette, this time featuring "Shadow Land", "Tina" and "Fiesta de Guerra" helped out by musicians Michael O'Brien on rhythm, Larry Lunchpail on drums, and Gord Kearney beginning his stint with the band on bass. ...the interest shown in the band's first efforts encouraged them to return to Bedclothes Studios to put down some more recordings. This produced the previously lauded "Fly By Night" CD which they recorded in January '94. Mike reported that the recording techniques were straight forward with one mike for each member and then mixing the results straight down from four tracks. The finished disc is of very high quality indeed and the "full, rich mono sound", as it is described on the sleeve, is arguably the best way to enjoy our kind of instrumental music. 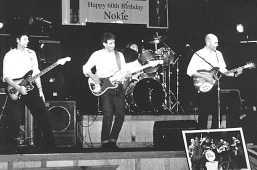 1995 has already proved to be a year of highlights with not only their highly successful appearance at the Pipeline Convention under their belts, but also a prestigious appearance playing at Nokie Edwards' 60th birthday party! Nokie was doubtless delighted to see how well some of those seventeen year old kids that he had inspired to pick up the guitar some thirty odd years ago had turned out. 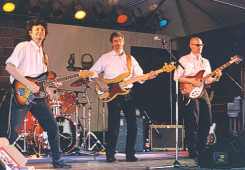 Mike is only too happy to honour the genre's vintage bands "Their influence", he says "is immeasurable, but we do not want to be a clone of anybody. To us it is important to create our own, updated version of the early sixties instro sound, something that people will recognise as our own Falcons sound". The band are already planning new recordings that will enable them to do just that. With the current upsurge of interest in instrumental music amongst the young - largely because of the appearance of the film "Pulp Fiction" which has spread the energy of our music directly to them - the prospects for the future look better than ever. The band feels that this is not just a passing phase but a genuine sea change and that the future will find RI assuming a greater importance in music. Certainly they all talk in terms of "spreading the instrumental gospel", which is the kind of evangelical crusading that is needed to change attitudes. Judging both from their CD and from their performance at our Convention they are poised to do just that. Personally I cannot think of any finer ambassadors. When The Falcons took the stage, their presence assured the crowd they were in for a treat. I was originally impressed by their demo tape but, live, the Falcons blew my expectations away immediately. Imagine yourself driving through the desert, heels on the dash of your green '69 Eldorado, wind blowing through your hair, arm around a cozy friend with the 8 track playing in the background - smooth - don't remember the stars this bright before... The Falcons brought out the atmosphere of the Railway like no other Shindig performer, with a cool, instrumental, Mexican twist on Chris Isaak. Be sure to catch these local wonders at a venue near you. Just don't forget to bring a wheelbarrow full of joints, a bathtub of margaritas, a padded recliner, and thick, shady sunglasses. It's nice to see some real musicians. The Falcons were over here all the way from Canada.This band is relatively new to me, having only heard the track "Shadow Land" from them previously. But let me tell you people these four guys were really a revelation! Bravely they kick off with two of their originals, they were startlingly intricate with memorable melodies betraying a good deal of technical ability on the part of their lead guitarist Mike Beddoes. "Out of Limits" follows and my notes from the day simply say "cool". Cool in extremis to be exact, deliciously played and more relaxed than you could ever imagine "Out of Limits" to be. Better still was the ballad "Tina", emotive, gorgeous, and sounding like Dire Straits could but don't. Standout stuff. Guitars are swapped for the catchy "Sombrero" and Eddy-ish "El Nino" which proves to be a good idea because rhythm guitarist Kim Clarke has a totally different style of guitar playing. Returning to their usual guitar formation they next took on "Pipeline", the announcement of which provoked a rapturous reception, and this too was every bit as different as "Out of Limits". Something to do with the neat harmonics that Mike produced I think, a technique you learn with classical training. The remaining three tunes, plus one encore. were every bit the equal of the earlier material (all originals too! ), displaying at times a distinct shift towards flamenco guitar. "Shadow Land" disappoints me a little, too much Marvin and not enough Beddoes but, that said, The Falcons were superb and my favourite band of the day. 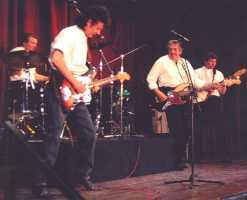 The Fentones with Mike Beddoes on rhythm guitar at Pipeline 1995.